When asked what Charmaine Thio’s experience with gin had been like up until now, she replied “Mostly drinking it, I guess,” with a laugh. Two months before her visit to Malaysia in October she was appointed Regional Brand Ambassador for Hendrick’s Gin, which has propelled her from working behind the bar at 28 Hong Kong St to the 9-to-5 corporate world. 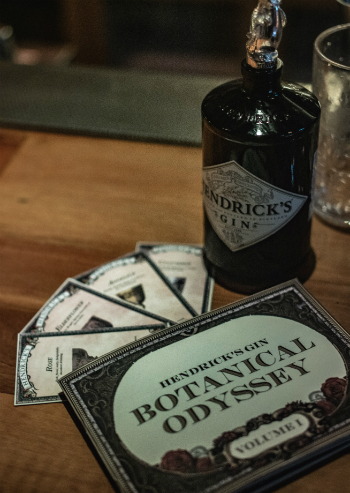 Hendrick's new Botannical Odyssey menu. Now with Hendrick’s, Thio’s focus is on launching the new Botanical Odyssey menu during her guest shifts, to get the consumer a little more informed. “We’re trying to take guest shifts in a slightly different direction,” she says. “Instead of just coming into a place and doing a few cocktails, we kind of want it to be a more immersive experience, something for you to take away, whether it’s a little cocktail card or something about the experience that’s a bit more engaging rather than me just being in a venue making some drinks for that day. So we want you to have a little token, something to remember us by and keep you coming back.” The cards offer a neat little guide on gin and about Hendrick’s, free for bar guests to take home with them whenever they have the good fortune to encounter Thio. The plan for 2019 is still being hashed out, but Thio confirms she and Hendrick’s will be at the usual festivals around the region (eg. Gin Jubilee, Bangkok Gin Fest, Whisky Live) as well as touching base with the surrounding markets two to three times a year, “just doing what I’m doing now, coming around and doing some training, guest shifts, meeting with people in the market.” Expect to see more of her in the coming year at a gin bar near you.